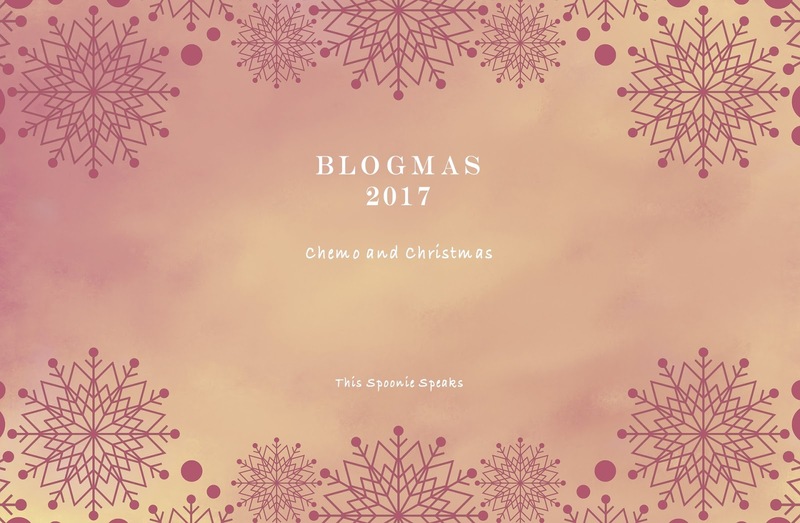 So I know I'm horribly behind on Blogmas posts, but I'm doing what I'm able to right now. 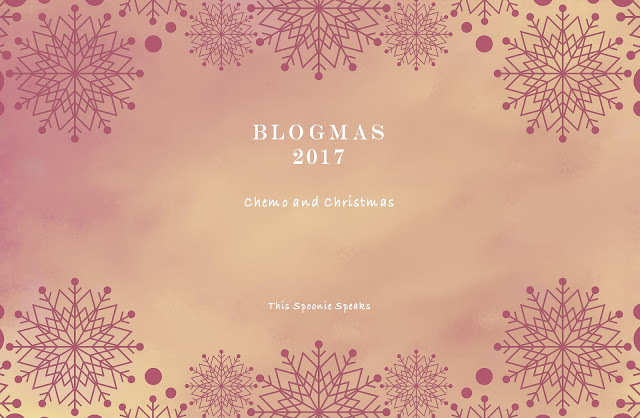 I know Chemo and Christmas probably shouldn’t even belong in the same title but this is a pretty important post for me. It has been a really hard year for me and I thought I would talk about it a bit. So I don’t really keep it a secret anymore that I’m am on chemotherapy. This is my second time on chemo; I take it due to my severe nonresponsive Psoriasis. I take Humira and my Psoriasis wasn’t entirely clearing so my Dermatologist put me on Methotrexate first. I was taking a pretty high dose for my size, but we were trying to knock out my immune system as much as possible. In the long run it ended up giving me some liver damage but as of my last labs a couple weeks ago my liver is completely healed and stable. I took the Methotrexate for thirteen weeks before I had to go off of it because it was hurting me more than it was helping me. So I started seeing a Rheumatologist a few months ago because my case has become too complex for my Dermatologist to handle on her own. The worst of my Psoriasis is located inside my ears, at first the Rheumatologist ran an extensive blood panel, they took so much blood that by the time I made it to my car I thought I was going to pass out. He gave me some steroid eardrops, which just felt awful and annoying, in the end they didn’t even help my Psoriasis either. When I went back for another appointment and my Psoriasis had actually worsened, which I didn’t think was actually possible but it was. My ears were a cracked, bleeding mess and incredibly painful. By this time my Rheumatologist was like we need to get you back on chemo as soon as possible. I now take a chemo called 6MP, it’s a chemotherapy used to treat certain types of cancers like Leukemia and to prevent organ rejection in transplant patients. I take it two times a day everyday; it doesn’t hurt as much as the Methotrexate did though which is always a plus. This drug greatly impacts my immune system and my ability to fight off infection. I wear a VogMask everywhere I go to cut down on infection risk, especially with it being winter and the flu being so bad this year. So you’re probably wondering how all of this relates to Christmas. Well chemo is used to treat a large range of autoimmune disorders, people you know may be on chemo and you might not even know it. And I’ve noticed around this time, even before I was on chemo that people tend to go to family events, church events, and really any kind of event that they go even if they are sick. Getting sick for a person on chemo could be a complete death sentence. It could land us in the hospital and probably require us to temporarily stop our treatment. Stopping treatment has it’s own drawbacks it leads to flares of our illnesses because our immune system is no longer being suppressed. Not to mention that for some going off our chemo can be pretty painful as our bone marrow “wakes up” and starts working overtime. Please if you are sick and we the immune suppressed people have to back out from a party or any sort of celebration on short notice, please don’t be mad, going to a party is not worth our life. Or if we the immune suppressed are throwing a party and you back out because you know we are sick, we will understand. Or if you think you feel a little off and stay away from us at a gathering we won’t be offended. The holidays are hard because it feels like there’s some sort of unspoken rule that attending all the parties and family gatherings are mandatory. All my immune suppressed friends remember that it’s okay not to go; you can spend time with your family once they get over their cold/flu. Life as an immune compromised person is like walking on a tight rope and you have no idea what will be sending you toppling over into a cold or other illness. Just be kind to us and we will tell you what we can and can’t do. Don’t be mad if we ask you several times if everyone attending a party is healthy. I myself, try to get people around me to take precautions against getting sick. The holidays are hard on us please work with us to make sure we stay safe and illness free. Remember we probably feel bad about not being able to attend parties and family gatherings.